Jeju will set up an emergency prevention system in relation to the Sanchi oil spill that occurred around 546 km south of Seogwipo in the East China Sea. The emergency control system will be made up of the National Fisheries Research & Development Institute, Korea Marine Pollution Response Corp, National Fishery Products Quality Management Service, National Federation of Fisheries, and other related organizations. This news comes after the Jeju Environmental Movement Association criticised the response of the government in relation to the oil spill. They said that other than some marine product toxicology test, the government had not prepared any clear countermeasures. They pointed out that in contrast, Japan is conducting preventive measures to block marine pollutants. They ended their statement by saying, “There are too many cases where the first response to an environmental pollution accident is lukewarm or passive and has evolved into an environmental disaster.” and appealing to the Jeju Government to take proper measures. Just how bad is the spill? While The Ministry of Maritime Affairs had predicted that damage due to the oil spill would be minimal, other prediction models run by the UK's National Environment Research Council suggested that there was a possibility that within three months of the incident contaminated water could reach Jeju. The spill site is in an area with several different ocean currents. While the most powerful is the Kuroshio current that heads towards Japan, there are also some weaker currents in the area that head north towards Korea. The oil-spill occurred earlier this month when an Iranian oil tanker called the Sanchi crashed into a Hong Kong-registered cargo ship and started to leak oil. A few days later, the ship, that had been carrying around 136,000 tons of light crude oil, burst into flames and sunk. 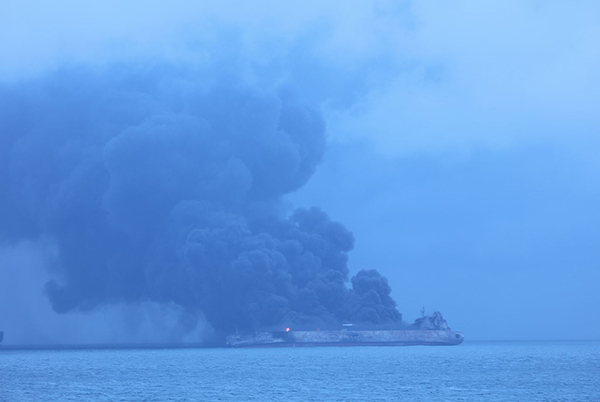 Reports at the time stated that smoke from the fire began to rise up to 800-1,000 meters high, before, a few hours later, the oil tanker sunk into the depths of the ocean. It was a tragic incident. Around 32 crew members from Iran and Bangladesh are thought to have died. However, more recent reports have painted a bleaker picture. This visual report by Reuters simulates the potential spread of the oil spill and explains what could happen in clear detail.